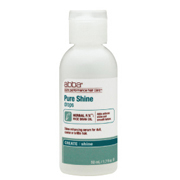 Abba Pure Shine Drops is a shine enhancing serum for dull, coarse or brittle hair. Smoothes, protects and adds luster to even the most unruly hair. Contains Rice Bran Oil to improve the condition and manageability of hair.